As has been commonly reported the difference between the sharpness from the D800 and D800E sensors is clearly observable, but not dramatic. Its something like the difference between a decent run-of-the mill zoom and a good quality prime. You can also see on the blow-up above the (very slight) colour noise in the image. Both images were shot with the same lens (Voigtlander 20mm f/3.5) and the same settings and processed identically in Adobe Camera Raw 7.1 in Photoshop CS6. Obviously those who are considering one or other of the two options will have to decide whether the extra sharpness in the D800E is worth the extra money. 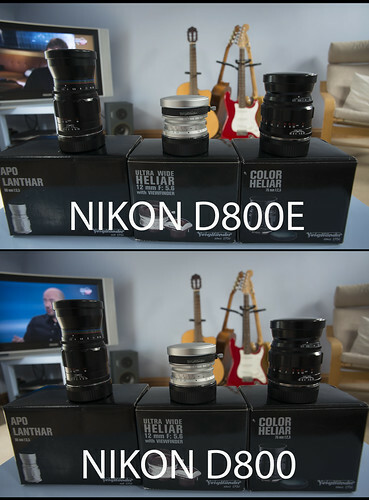 My D800E came with a copy of Nikon NX2 software included, which explains part of the price difference. This then makes the D800E around £250 dearer at current UK prices. I'm a dedicated pixel-peeper with a sharpness obsession so I'm happy to pay the difference. I would say that both the non-AA filter CMOS sensors on the D800E and the Fuji X-Pro 1 do look somewhat different to the non-AA CCD sensors I've used in the past. Though whether the Nikon can be described as non-AA is somewhat contentious since there is one on the sensor and another added to negate its effect. However its certainly the case that both have terrific high-ISO performance, which the CCD sensors I've used previously do not.